Attention fashion lovers! You know when you see something so amazing and you just have to have it? It’s that feeling when you see something and you just have to have it or you feel like you might be sick? I know I’m not the only one! 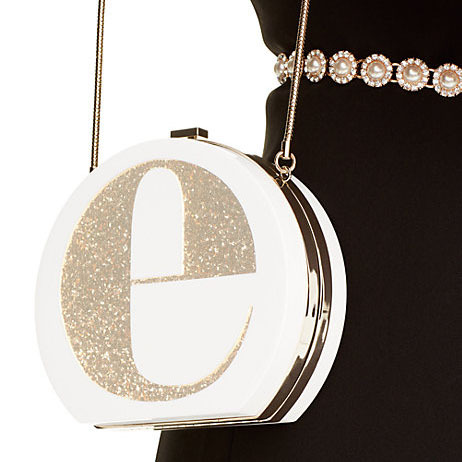 That’s how I felt when I saw this lovely initial glitter clutch. The first thing I thought was: Holiday Parties! I know we are no where near close to Christmas or New Years but this lovely little bag would make the perfect statement piece to go with your Holiday Outfits! I also have a thing for chain link straps and I love that this one has a snake chain strap so it’s quite different than some of the other bags I have! Plus, what girls doesn’t love glitter? Oh….and what is the best part??? THE PRICE! This bag retails for $398 and is part of the Kate Spade Surprise Flash Sale going on right now. The sale price is $139! Say what? Count me in! Be sure to check out the other amazing items in the sale as it only lasts until tommorrow and some items are up to 75% off! You can’t beat that for designer pieces and there is NO COUPON CODE needed!